Today I am supposed to tell you all about my biggest Diabetes supporter. It may sound absolutely cliché, but the fact is my biggest supported is my mom, Sue. Even now, at a distance of nearly 2,000 miles away, I call her frequently to vent about Diabetes-related frustrations, and she always responds with a, “I wish I was there so I could help you.” She was there when I was diagnosed, when all those “girl” things started happening (within a week of my diagnosis, my body was like…holy crap, what is happening in here?!?!?! ), when I first went on an insulin pump, when I got a new pump and had to send the first one back, when I changed the type of sites I use, when I tried to figure out which test kit and needles worked best, when I started having allergic reactions to the adhesives, when I needed to pig out on chocolate no matter how many carbs it set me back…yup, she has always been there. 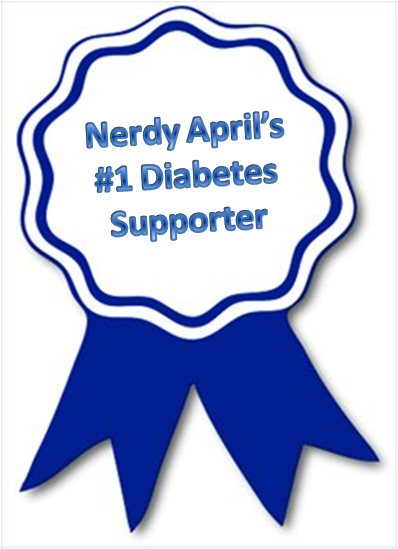 And don’t get me wrong, Diabetes requires maximum support and there have most definitely been other supporters (i.e. Dad, Heather, Chris, Liz, etc.). Most everyone I have met has done me a Diabetes-favor, and for all those acts of kindness I am forever grateful. Like that time I forgot my lancing device and Dad (deathly afraid of needles, and clicky things) “manually” poked my finger, or all those times Heather retrieved my test kit before supper, or the time when Liz dropped off my English paper and took me to a church meeting before I headed to the ER with a severe kidney infection, or that time Chris saved me when our cat Gordo chewed a hole through my pump tubing. Oh, and there was that one time I decided to test my family’s blood sugars for a whole day as part of a science project I came up with, thanks guys. Thanks Mom for everything, you have officially earned the title of “Nerdy April's #1 Diabetes Supporter”. And thank you everyone else in my life for your unending supply of Diabetes support!